Being the 4th largest religion in the world Buddhist pilgrimage tours are taken up by numerous individuals on a daily basis. Namaste India trip presents you with the option of going on the footsteps of Buddha 1 tour package which lasts for a soul enriching 17 days and 16 nights. With every destination you will be experiencing a time which is memorable and not easily forgotten for the journey taker. 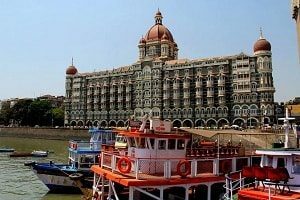 You will be arriving at Mumbai where from the meeting point you will be escorted to your allotted hotel for spending the night, by our representative. This time is for you to prepare for the next day from when your journey on the footsteps of Lord Buddha will commence. Early in the morning you will be taken to the 8th century UNESCO world heritage caves of Elephanta. You will be transferred to this magnificent ancient spot via a boat ride on the island of Oman and is linked to the cult of Lord Shiva. You will then be taken back to the mainland where you will be shown the gateway of India, which is one of the main landmarks of this city of dreams. Your next stop will be marine drive a 3.6 km long boulevard, which is also known as the queen’s necklace. Later you will be taken to Colaba causeway which is the prime shopping destination where the lanes are lined with boutiques and fashionable clothes, shoes and accessories which are available at throwaway prices. You will also be made to witness the grand laundry centre of dhobi ghat along with paying a visit to the pleasant hanging gardens form where you will be able to witness the picturesque Mumbai city and Arabian sea. By the end of the day you will be taken to the teeming and colorful Crawford market before heading back to your hotel. You will be made to head towards Aurangabad via train. You will be reaching ‘the city of gates’ by late afternoon. You will then be straightaway transferred to your hotel where you will check in and freshen up. Later in the day you will be escorted to one of the prime tourist attraction here i.e. bibi – ka – muqbara, which is a pearly white structure built by Aurangzeb’s son dedicated to his mother. 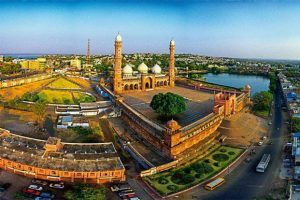 Along with this, if time remains you will be taken to the famous fort of Daulatabad, which stands atop a conical hill which rises to a height of about 200 metres with an aim of improving the defense line. Finally you will be made to head back to your hotel where you will also be served dinner. 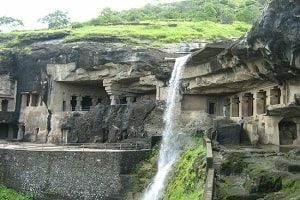 You will be taken to an excursion of the Ellora caves, which is at distance of 30 kms from the main city consisting of some of the finest rock cut cave temples dating back to 10th and 11th century. The best part about this place is that the entire structure has been carved out in a monolithic manner and took 100 years to complete. After a day of exploring the caves you will be driven back to the hotel after which the evening time is free for you to explore the nearby places of interest and shop for some souvenirs like traditional artifacts, fabrics, antique statues and so much more. *Ellora caves are closed on Tuesdays. Today you will be taken to the caves of Ajanta which is located at a distance of 100 kms (2.5 hour drive) in the Waghora valley. The 30 magnificent rock cut caves date between 2nd century BC to 7th century AD. After you spend some quality time among the unique caves, you will be transferred to the railway station where you will board the train for Bhopal. This will be an overnight journey. *Ajanta caves are closed on Mondays. Upon arriving at Bhopal you will be taken for brief sightseeing tour of the Buddhist complex of sanchi stupa which is of huge relevance to every Buddhist since it is an ancient stupa sitting on top of a hill overlooking the picturesque town. Built in 3rd century to 12th century BC the entire complex is surrounded by important monasteries, temples, pillars and other structures of extreme Buddhist relevance. Later in the afternoon you will duly be transferred to the railway station where you will be boarding the train to Agra. Upon arrival you will be straightaway taken to your hotel for spending the night. Your morning sightseeing will start off with a visit to the magnificent 7th wonder of the world Taj Mahal. This pearly white wonder is lined with neat gardens, fountains and the walls are adorned with intricate stone inlay work while utilizing the Indo – Islamic architectural style. In the afternoon you will be taken to Agra fort which is located right next to Taj Mahal. This red sandstone structure had served as the power centre during the Mughal era. In the evening you will then be taken to the railway station where your overnight journey towards Varanasi will kick start. *Taj Mahal is closed on Fridays. 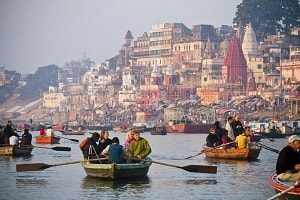 Upon arriving in Varanasi early in the morning you will be immediately transferred to your hotel where you will freshen for your sightseeing tour of this ancient city. Your tour will start with the place where Lord Buddha gave his very first sermon, Sarnath, and is also located by the banks of the confluence of River Ganges and Varuna. In the afternoon your temple tour will commence which will include a visit to the famous Vishwanath mandir, the unique Bharat Mata mandir and Tulsi Manas mandir which is dedicated to Lord Rama. In the evening you will head on towards the ghats to witness the glorious and soul clarifying Ganga aarti, before proceeding back to your hotel. Early in the morning you will be taken for a boat ride on the holy River Ganga to witness the wonderful rising sun. After breakfast you will be made to head on towards one of the most pristine and holy centre of pilgrimage for Buddhists, Bodhgaya. After completing the 7 hours drive and upon arriving at Bodhgaya you will be made to check in to your hotel for staying the night. 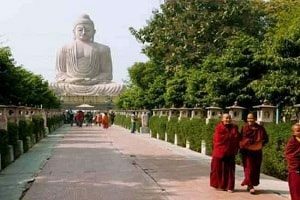 Your Bodhgaya sightseeing tour will commence early in the morning by paying a visit to the sacred and glorious Mahabodhi temple which was built by Ashoka and houses the famous Bodhi tree’s descendant under which Buddha had attained his enlightenment. You will then be guided towards Bodhgaya archeological museum which showcases a collection of Buddhist sculptures which date between 1st century BC to 11th century AD. Later, before heading back to your hotel, you will also be taken to the famous Jagannath temple which is home to the unique four armed statue of Lord Shiva done in all black stone. 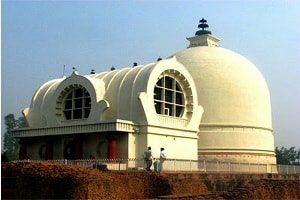 You will be driven to Patna after breakfast while en route you will be made to visit the famous Gridhakuta hill (vulture hill). This was one of Buddha’s favorite retreat spots among several others where he gave his numerous discourses. You will then be made to head towards Nalanda (14kms from Rajgir) which is one of the oldest universities in the world and during its peak time it catered to innumerable international students (Thailand, china, Tibet and more) since it was the prime centre of education for Buddhist studies and Buddha had also given lectures on Buddhism here. Upon arriving in Patna and post lunch you will be taken for a city tour where you will be visiting Har mandir sahib – the place of birth for the 10th Guru of Sikhs, Guru Gobind Singh; Golghar will be next on your visitation list which is a large dome structure atop from where you will be able to get a bird’s eye view of the surrounding city and the fast flowing Ganga river. Before heading back to your hotel you will be taken for a visit to Patna museum – which showcase the rich and opulent collection of Mauryan and Buddhist sculptures, terracotta artifacts, paintings amongst other interesting items. Early in the morning your 7 hours of drive towards Kushinagar will commence. Kushinagar is the place where Lord Buddha had attained his paranirvana after his demise. Upon your arrival here you will be checked into the hotel where you will freshen up for a visit to Rambhar Stupa – which marks the place where Lord Buddha’s cremation ceremony took place, making it one of the most vital pilgrimage destination for Buddhists. Later you will be taken to Mahaparinirvana temple – the place where Lord Buddha took his last breath and it also houses a reclining statue of him. You will be driven to Balrampur, which is a 5 hour journey from Kushinagar and upon your arrival there you will be checked in to your hotel. During the afternoon you will be made to visit Sahet-Mahet, which is a 32 sq. km. complex comprising of various temples, stupas and monasteries. After your visit here you will be escorted back to your hotel for an overnight stay. 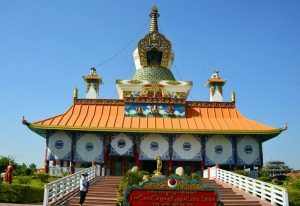 Your early morning will commence with a 4.5 hours journey towards Lumbini – the birthplace of Buddha (563 BCE). The remainder of the day is free for your leisure activities where you can browse through the teeming marketplaces and enjoy some quality time with your loved ones before heading back to your hotel. You will be travelling to Kathmandu – one of the most spiritual centres of pilgrimage among Hindus and Buddhists. The flight will be of afternoon and the journey will be of 1.5 hours. Kathmandu is known for its scenic, natural beauty surrounding it and the magnificent views of the snow capped mountain which serves as the city’s mighty backdrop. You will be checked in to your allotted hotel and your evening time is free for your leisure activities. You can shop for various souvenirs like, singing bowls, pashmina shawls, prayer wheels, Nepalese paintings (thankas) and silver jewelry. You can also try out a plethora of various Nepalese cuisines like, samay baji, sel roti, chatamari, traditional momos among others. Your city sightseeing tour will start off with a visit to the sacred Pashupatinath temple (dating back to 1696) – one of the most highly revered temple for Hindus which is dedicated to Lord Shiva. You will then be taken for a city sightseeing tour of Patan – the third largest city in Nepal and also popularly known as the city of festival and feast, art and architecture and fine and ancient art. You will be taken to the UNESCO world heritage site of Patan Durbar Square, Bhandarkhal Garden and Tusha Hiti, which are magnificent representations of the tasteful artwork. After having a fulfilling lunch meal you will be taken to Swayambhunath – oldest Buddha shrine, and it set atop a hill. You will be taken for a small road trip to Boudhanath – world’s largest stupa (36 metres) and a UNESCO world heritage site. Kasthamandap will be the final destination for your day before heading back to your hotel. This is a 7th century, 3 tier structure which houses the gorakhnath shrine inside. Today your footsteps of Buddha trail package will conclude after you are transferred to the airport from where you will be free to head on towards your destination.